A team of Spanish researchers have reviewed the fossil evidence for cold climate fauna in the Iberian Peninsula and although the likes of Woolly Mammoths, Woolly Rhinos and Reindeer (mega fauna) were relatively rare, there is evidence to suggest they existed in this part of southern Europe some 150,000 years ago. The researchers, from two Spanish Universities, the University of Oviedo and the Complutense University of Madrid collated all the fossil evidence for the existence of species associated with cold climates, extinct animals such as the Woolly Rhino (Coelodonta antiquitatis) as well as extant species such as the Reindeer (Rangifer tarandus) and the Arctic Fox (Alopex lagopus). Using these species, as well as several others, as prehistoric indicators of cold climates; the team have linked their work to the palaeoclimatic scale created on the basis of the isotopic composition of oxygen in ice cores taken from Greenland. The paper, published in the scientific journal “Quaternary International” reveals that the most ancient fossils of mega fauna adapted to cold climates found in the Iberian Peninsula belong to mammals which lived in isolation in Spain approximately 150,000 years ago. The faunae can be plotted against ancient climate data and the research suggests that animals adapted to a cold climate became more prevalent in Spain about 45,000 years ago, as cold periods alternated with milder, warmer periods. According to the research team, the last findings of these cold species date back to just 10,000 years ago, and coincide with the end of the last glacial phase. At that time the climate became warmer and the more settled climate of the last ten millennia helped the human population thrive in the more favourable habitat. The increase in temperatures across the northern hemisphere led to the faunae that was most suited to glacial environments being forced to migrate into more northerly latitudes. The research team used analysis of pollen remains to assess the landscape of the period in which the great mammals lived in the Iberian Peninsula comprised mainly of “steppe-like” flora. The researchers conclude that trees would have been very scarce in the times of extreme cold and environmental aridity. A total of seventy-two sites were studied, most in the north, but also in the south of the Peninsula, the researchers point out that these prehistoric animals co-existed with two species of human, the Neanderthals and our own species (Upper Palaeolithic era in Western Europe). 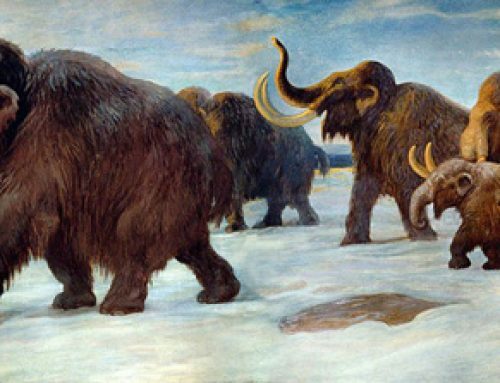 Article information supplied in part by Plataforma SINC (07/09/2010) – Woolly Mammoth, Woolly Rhinoceros and Reindeer lived on Iberian Peninsula 150,000 years ago, findings show – Science Daily.